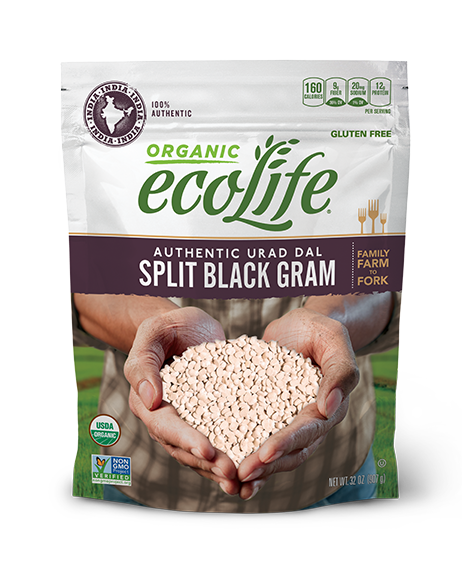 ecoLife® Organic Split Black Gram is authentically sourced from India, where it is commonly used to prepare popular delicacies such as dosa, idli, vada, papad, dal makhani and mixed dal tadka. Split Black Gram is high in protein and low in cholesterol, making it perfect for a healthy diet. Combine 1 cup Split Black Gram and  3 cups water in a saucepan. Bring to a boil. REDUCE HEAT to a simmer (medium-low to medium), cover and cook for 30 minutes. Add more water if necessary to keep the Split Black Gram submerged. When done, Split Black Gram should be tender and soft. Combine 1 cup Split Black Gram and 3 cups water. Never fill cooker more than half full. Bring to pressure on high heat. Reduce heat to low, but keep under full pressure and cook for 10-15 minutes.